“HILFE, HILFE!”: As we are gearing up on the jetty for an exploration dive in the lake, Charly surfaces in a panic and starts flapping his arms franticly while trying to keep afloat. Unaware that he was even underwater, we have to react quickly and efficiently: Tim will lead the emergency response from the shore, gathering O2 and first aid equipment, and calling in emergency services, while after a rapid but thorough buddy check, we jump in the lake for the rescue with Andy, swimming to the victim while assessing the situation and getting ready for the unexpected. Welcome to lake Fuehlinger, near Cologne, Germany, where the ESA Neutral Buoyancy Facility divers and instructors have been wreaking havoc on us for three days, and where divers running around with O2 equipment and AED or towing others to the shore have become a common sight for the tourists enjoying the late august sun on the beach, who lazily look at our unrest with a certain bemusement. 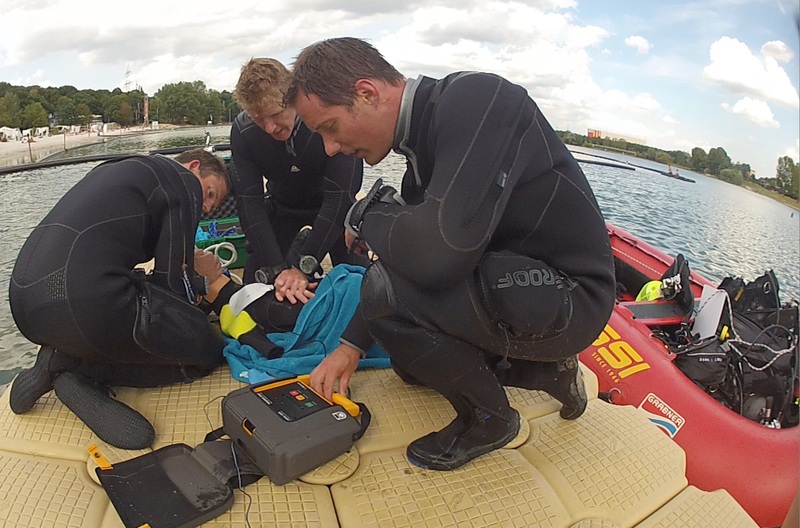 We are being certified as Rescue Divers, an additional qualification behind our belts that, although not directly related to spaceflight tasks, will help us cope with the demanding operational training for them. Would it be for NEEMO (see Tim’s previous blog posts), for survival training, CAVES (see Andreas’ posts), NOLS (see Samantha’s), any other exploration training or simply for EVA runs in the pool, we are often confronted with risky and demanding environments, where water can play a big part. Even though no space agency in the world would like to see one of its astronauts put to harm, and therefore ESA takes safety seriously, better even safer than sorry and it’s good to be able to provide to the people around (safety divers, instructors, other astronauts) the same level of safety they provide us with. So here we are, quickly finding out that Charly is not the main problem, as he rapidly recovers his breath following Andy’s directions to inflate his BCD, keep his regulator in the mouth and breathe calmly, while I swim around to his back, just in case we would have to take things into our own hands and control his movements: the easiest way to do so is to grab his tank by behind, and cradle it between your own legs. He soon tells us that he has lost Kathrin, his diving buddy, and we will afterwards have to find her, strangled by a chain or blocked under a platform somewhere in the muddy waters. Ansgar, caught in a chain underwater, is starting to panic… doesn’t it look like the real thing?! We will, without a doubt, have to prevent a panic ascent, rescue her to the shore or to the boat, provide her with O2, perform rescue breaths, CPR and even defibrillation while trying to safeguard equipment and pay attention to every little detail until the emergency personnel arrives and takes over, basing their actions on our exhaustive report. Of course, in reality, chances are very slim that Charly, Kathrin or any other NBF divers would find themselves in such a situation: they are seasoned diving professionals and their scuba diving skills are probably only matched by… their acting skills! Every emergency scenario has been carefully planned by Hervé and the team, with different options unfolding, depending on our reactions (just like those books I sometimes read as a kid: “if you choose to start an underwater search pattern, go to page 28, if you stay at surface with Andy and call for help, go to page 87”). Should we ask an “inexperienced” diver (NBF divers play our buddies with candour) to take too big a part in a rescue, then he will get in trouble himself, only worsening the scenario. But we are now prepared for it after a few days of theory, of rehearsing the skills in the NBF, and of getting familiar with the equipment. We manage to get not too much caught by surprise even when we are being tricked badly (“no no, only half of the divers are here this morning since today is only the familiarization dive in the lake: it would be too expensive to have all of them here all the time, you know…” and then comes in running the waitress from the nearby restaurant, shouting in German that something is wrong at the lake as we are drinking the 8 AM morning coffee). We look at each other with a “oh, not again!” look, and we start responding to the situation in a structured way, trying to make use of everything and everyone we have available to maximize safety and chances of success of the rescue. The wole team enjoying a well-deserved break… keeping eyes open! Non non Gabrielle, c’est la vraie motivation (officielle) de certains de ces entraînements: nous préparer à des expéditions un peu plus lointaines que l’orbite basse. Sorry to ask but… what’s with the name of the “unfortunate victim” ? Well it’s just the name of the standard mannequin we have at EAC (it’s written on her shirt)… no special intention here! But hey, she’s a lucky girl: she’s been on parabolic flights, on rescue diving training, etc… she’s as close as being an astronaut as you can be without passing the selection! Now everyone knows rescusi Anne in the space community!